For a comprehensive list of other publications please visit the following link [PUBLICATIONS]. PCT of the International Patent Application WO 2018/152628 (A1) [PDF file (4.54 MB)] entitled - METALLURGICAL AND CHEMICAL PROCESS FOR RECOVERING VANADIUM AND IRON VALUES FROM VANADIFEROUS TITANOMAGNETITE AND VANADIFEROUS FEEDSTOCKS. - (Inventor: François CARDARELLI) This novel chemical process addresses the recovery of vanadium, iron, titanium and silica values from a plethora of vanadiferous feedstocks such as vanadiferous titanomagnetite, iron ores and concentrates: magnetite and hematite, vanadium containing industrial wastes such as BOF-slags and other industrial by-products also containing vanadium. The process broadly comprises digesting the vanadiferous feedstocks into concentrated sulfuric acid owing to the exothermic sulfation reaction that allows to operate quasi-autogeneously while producing a sulfation cake. The dissolution of the sulfation cake after separating the insoluble solids yields a concentrated pregnant solution. After reducing electrochemically the pregnant solution, the reduced pregnant solution is then subjeced to to chilling and crystallization to yield clean crystals of copperas (ferrous sulfate heptahydrate: FeSO4.7H2O), and produces an iron depleted solution. The process further comprises removing titanium as titanium hydrolyzate [TiO(OH)2] by hydrolysis from the iron depleted solution thereby producing a vanadium-bearing pregnant solution. The further concentration by evaporation and then a sequence of chilling and crystallization yields vanadyl sulfate pentahydrate crystals [VOSO4.5H2O] to be purified further to prepare various vanadium chemicals such as vanadium pentoxide both to be used as precursors for the preparation of vanadium electrolyte (VE). 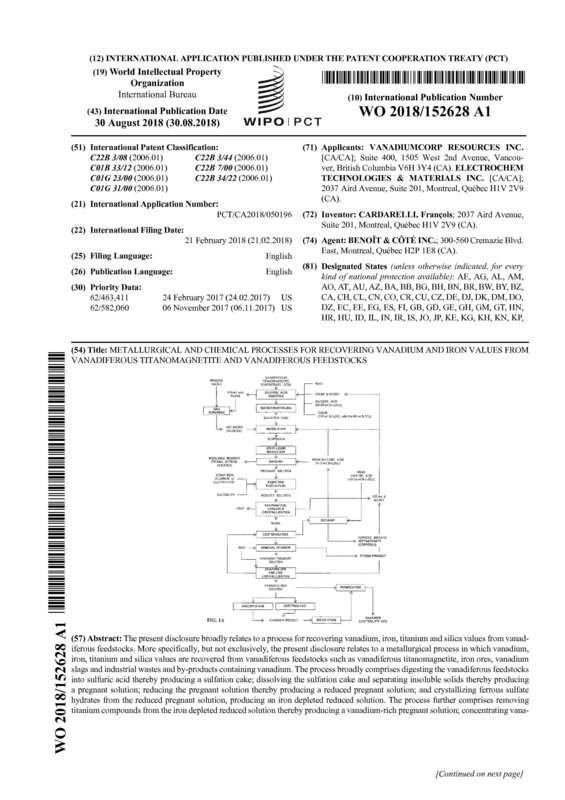 PCT of the International Patent Application WO 2014/071510 (A1) [PDF file (3 MB)] entitled PROCESS FOR RECOVERING RARE EARTH OXIDES FROM PHOSPHORS, FLUORESCENT LAMPS AND LIGHT BULBS, CATHODE RAY TUBES AND OTHER INDUSTRIAL WASTES. (Inventor: Francois CARDARELLI) This novel process addresses the recovery of rare earths oxides from phosphor dusts, fluorescent lamps and light bulbs, cathode ray tubes and other industrial wastes containing rare earths elements in the form of halophosphates, tri-band phosphors and other fluorescent materials. The process consists: (1) to submit the wastes or spent materials to either caustic fusion or hot alkaline leaching; (2) to perform the hot alkaline leaching of the solidified melt to produce insoluble solid residues and a barren alkaline leaching solution; (3) To recover the tri-basic sodium phosphate by crystallization from the barren solution;(4) to oven-dry or calcine the insoluble solid residues; (5) to perform the hot acid leaching of the oven-dried or calcined solids; (6) to recover the cerium (IV) oxide from insoluble solids; (7) to reduce the cerium-free solution, precipitate, acid leach, precipitate, calcine and recover the europium (III) oxide; (8) to precipitate the remaining rare earths as oxalates; (9) to calcine the rare earths oxalates and dissolve the rare earths oxides in acid; (10) to separate the yttrium, gadolinium, terbium and erbium by ion exchange (IX) or solvent extraction (SX); (11) to precipitate and calcine the pure oxalates to yield pure yttrium (III) oxide, gadolinium (III) oxide, terbium (III, IV) oxides, and erbium (III) oxide; (12) Finally, to regenerate and recycle the spent alkaline solution after causticizing with calcium oxide or calcium hydroxide; Canadian Patent CA 2,878,486 C, February 9th, 2016 [PDF file (1.84 MB)]. 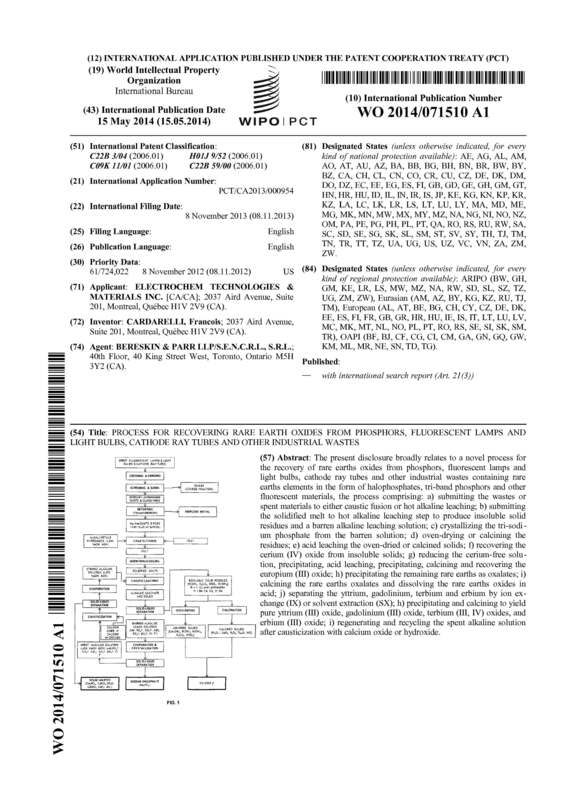 PCT of the International Patent Application WO 2013/040694 (A1) [PDF file (3 MB)] entitled - PROCESS FOR UPGRADING TANTALUM AND NIOBIUM ORES AND CONCENTRATES WITH THE RECOVERY OF MANGANESE AND RARE EARTH OXIDES. (Inventor: Francois CARDARELLI) - Process for upgrading tantalum and niobium ores and concentrates is described herein. The process comprising: a) submitting the ore or concentrate to a caustic fusion or an alkali fusion using a melt comprising at least one salt of an alkali metal to produce a solidified melt; b) submitting the solidified melt to an alkaline leaching step to produce an alkaline pregnant leaching solution comprising manganese values; c) recovering the manganese values from the alkaline pregnant leaching solution to produce a substantially manganese-free leach solution; and d) precipitating tantalum and niobium as an insoluble sodium niobiate and tantalate from the manganese-free leach solution. Acid leaching the sodium niobiate and tantalate to yield a mixture of pure niobium and tantalum oxides. 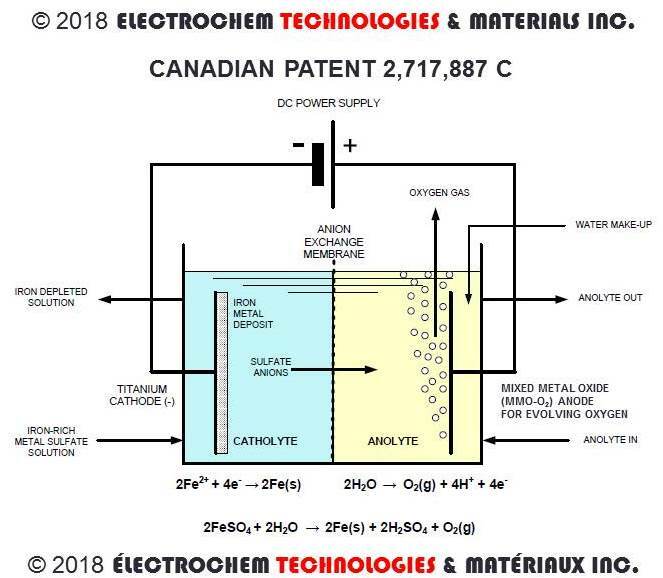 The rare earth oxides are recovered from the insoluble solid residues obtained during alkaline leaching; Canadian Patent CA 2,849,787 C, April 21st, 2015 [PDF file (3.30 MB)]. 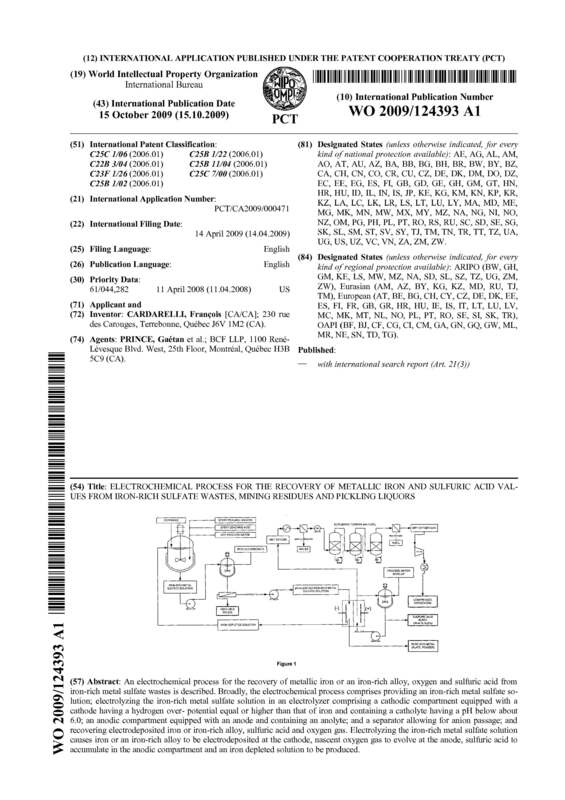 PCT of the International Patent Application WO 2009/124393 (A1) [PDF file (2 MB)] entitled - ELECTROCHEMICAL PROCESS FOR THE RECOVERY OF METALLIC IRON AND SULFURIC ACID VALUES FROM IRON-RICH SULFATE WASTES, MINING RESIDUES, AND PICKLING LIQUORS. 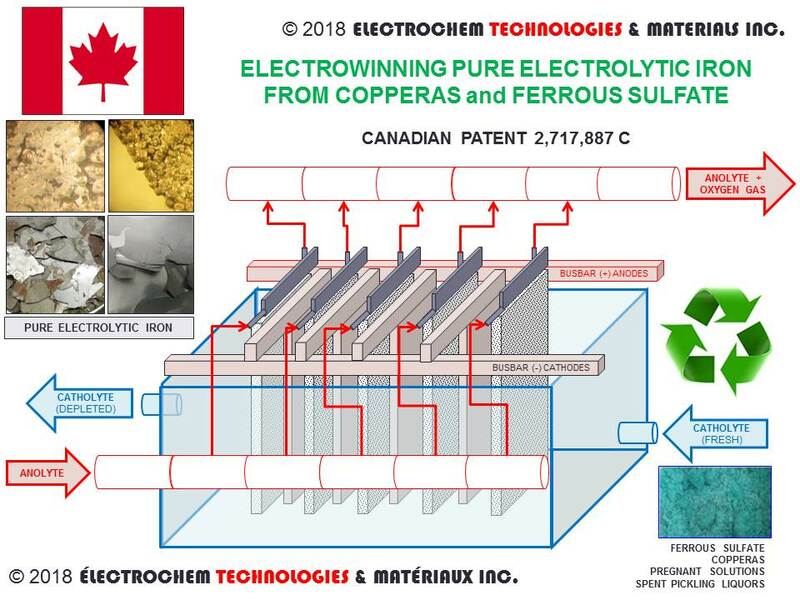 (Inventor: Francois CARDARELLI) - The patent describes a novel electrochemical technology for recovering metallic iron and iron-rich alloys and concurrently regenerating sulfuric acid from iron-rich sulfate wastes, such as ferrous sulfate heptahydrate (FeSO4.7H2O), also called copperas in the trade, currently by-produced from the titanium white pigment industry, spent pickling liquors (SPLs) originating from iron and steel making plants, and finally pregnant leach solutions (PLS) generated during the acid leaching of ores and concentrates at various minerals and metals processing plants. 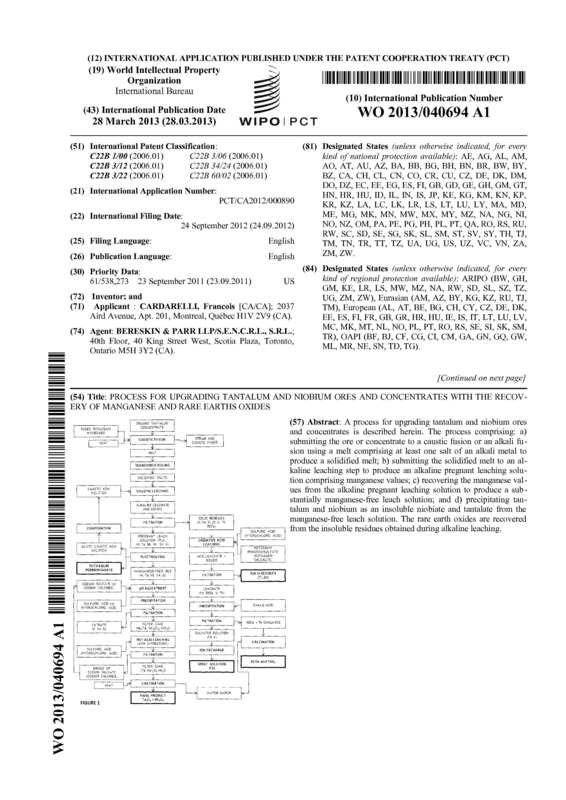 PCT International Patent Application WO 2008/017156 A1 [PDF file (3 MB)] - entitled - COMPOSITE METALLIC MATERIALS USES THEREOF AND PROCESS FOR MAKING THE SAME. 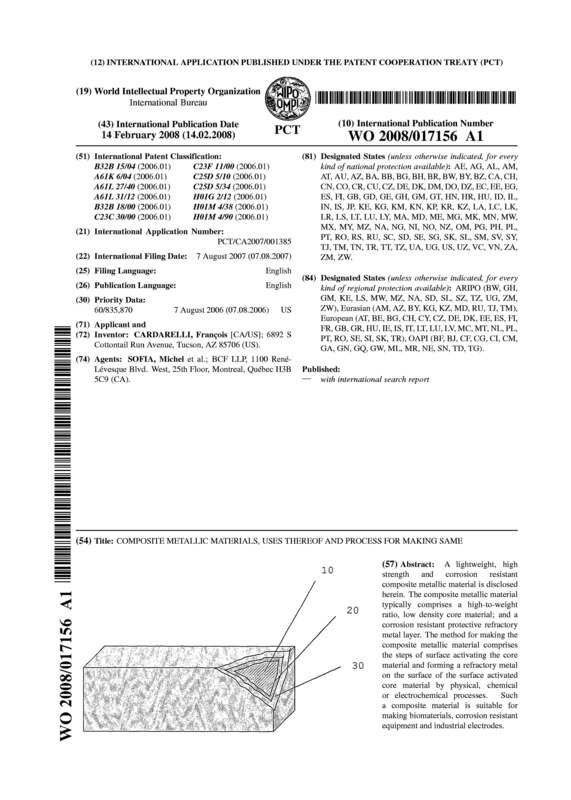 (Inventor: Francois CARDARELLI) - A lightweight, high strength and corrosion resistant composite metallic material is disclosed herein. The composite metallic material typically comprises a high-to-weight ratio, low density core material; and a corrosion resistant protective refractory metal layer. 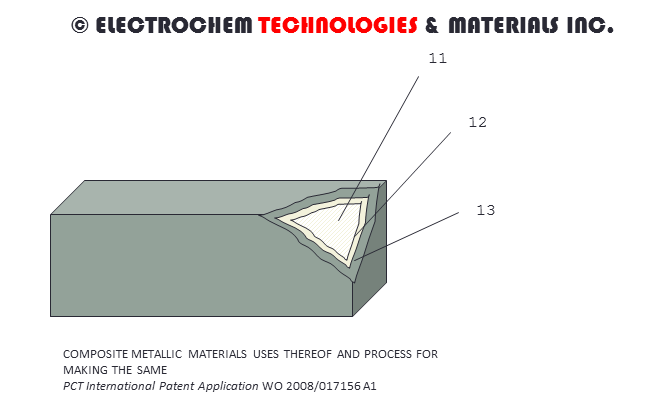 The method for making the composite metallic material comprises the steps of surface activating the core material and forming a refractory metal on the surface of the surface activated core material by physical, chemical or electrochemical processes. Such a composite material is suitable for making biomaterials, corrosion resistant equipment and industrial electrodes. 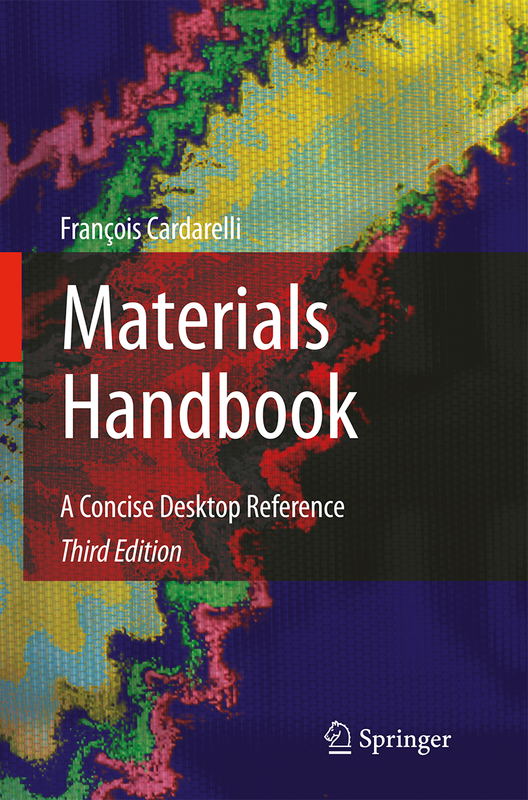 The unique and practical Materials Handbook (third edition) provides quick and easy access to the physical and chemical properties of very many classes of materials. Its coverage has been expanded to include whole new families of materials such as minor metals, ferroalloys, nuclear materials, food, natural oils, fats, resins, and waxes. Many of the existing families - notably the metals, gases, liquids, minerals, rocks, soils, polymers, and fuels - are broadened and refined with new material and up-to-date information. Several of the larger tables of data are expanded and new ones added. Particular emphasis is placed on the properties of common industrial materials in each class. After a chapter introducing some general properties of materials, each of twenty classes of materials receives attention in its own chapter. The health and safety issues connected with the use and handling of industrial materials are included. Detailed appendices provide additional information on subjects as diverse as astronomical data, crystallography, spectroscopy, thermochemical data, analytical chemistry, corrosion resistance, and economic data for industrial and hazardous materials. Specific further reading sections and a general bibliography round out this comprehensive guide. The index and tabular format of the book makes light work of extracting what the reader needs to know from the wealth of factual information within these covers. ENCYCLOPAEDIA of SCIENTIFIC UNITS, WEIGHTS and MEASURES. Their SI equivalences and origins. 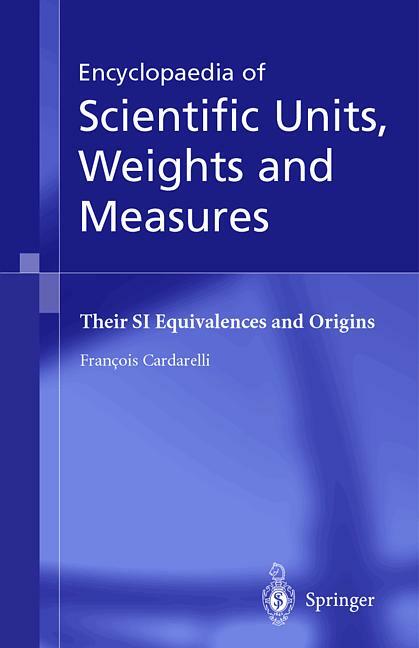 With more than 5,000 units and 35,000 conversion factors The Encyclopaedia of Scientific Units, Weights and Measures covers the full gamut of science, technology and medicine, and deals with US customary, Imperial British, conventional metric, MTS, MKpS, MKSA, CGS (esu, emu and Gaussian), FPS, IPS, atomic units (au), historic and SI units. The book allows to convert the huge variety of units from all over the world in every period of recorded history into units of the SI. Featuring: * An A - Z of conversion tables for over 5,000 units of measurements. * Tables of units arranged according to the physical quantities (e.g., mass, length, area, volume, density, viscosity, etc.). * Tables of mathematical and fundamental constants. 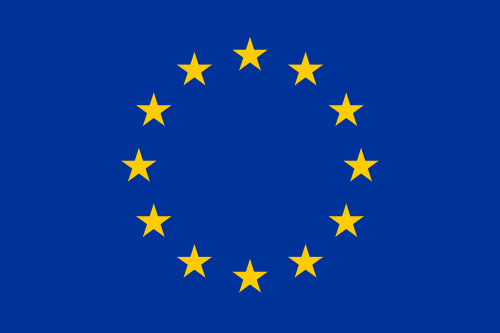 * Listings of professional societies, and national standardization bodies for easy reference. * An extensive bibliography detailing further reading on the multifarious aspects of measurement and its units. This huge work is simply a "must have" for any reference library frequented by scientists, engineers, and students of any discipline or by those with historical interests in units of measurement such as historians and archaeologists. CONTENTS [Detailed Table of Content & List of Tables PDF file (88 KB)]: - Introduction.- The International System of Units (SI). - Other Systems (UK, US, FPS, MTS, MKpS, CGS, IEUS, atomic units, ancient times systems, and obsolete national systems). - Conversion Tables. - Mathematical and Fundamental Constants. - Appendices. - Bibliography.